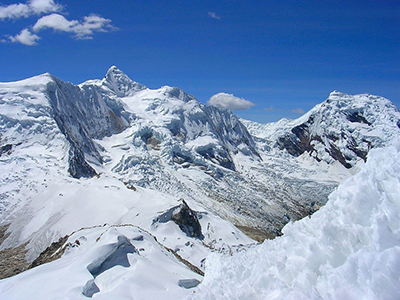 Ishinca (5530m) is an easily accesible mountain which does not require much experience. It is located in the gorgeous Ishinca valley, which hosts stunning flora and fauna (notably the condor). We depart from Huaraz to the villaje of Collon to 3500m. From there begin our trek into the valley of Ishinca and then arrive at our base camp (4350m). We begin the ascent to the summit of Ishinca, which is at 5530m. After a short break at the summit, we will begin to descend down to our base camp to rest. We depart the Ishinca base camp toward the town of Pashpa, where we will take our bus back to Huraz.